The Hypoallergenic Dog – Is There Such a Thing? Is there a truly hypoallergenic dog breed? Well, the short answer is – sort of. There are allergy-friendly dog breeds. No dog is totally allergy-proof. Even breeds that don’t shed, or at least shed very little, can still trigger allergies. That’s because dog hair isn’t what’s triggering your allergies. The flakes of dead skin, or dander, that’s lying under all that hair is what causes most allergies. 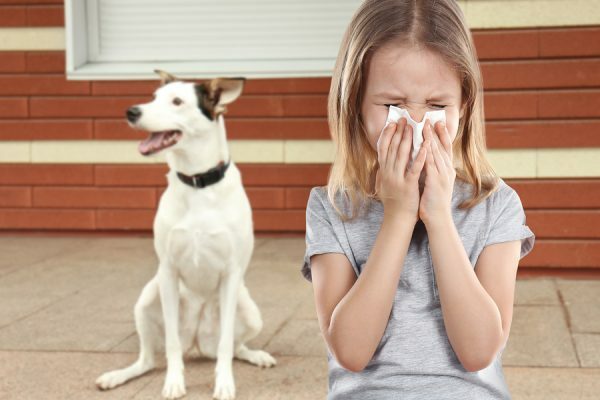 Dog saliva and urine also contribute to your dog allergy symptoms. So, what’s an allergic dog lover to do? Choose a breed of dog that sheds less. Not because of the hair so much as their ease of maintenance. These allergy-friendly dog breeds generally don’t have dense undercoats that trap dander and other allergens. They’re easier to bathe and that may also contribute to getting rid of that annoying dander. Regular baths also rid the coat of saliva, pollen, and other allergy triggers. According to the Dog Allergies Online website, an ‘allergy-friendly’ dog tends to have almost human-like hair that doesn’t shed as much as typical dog hair. They frequently have short coats (or even no coat – like the Chinese Crested or Mexican Hairless). Other breeds sport curly coats, such as the Poodle’s or Irish Water Spaniel’s, or the wiry coats that are typical of many terriers. Generally, allergy-friendly dog breeds are less slobbery than some other breeds. Since saliva can trigger allergy symptoms, a dog that isn’t cleaning itself with a slobbery tongue or splashing drool around with every shake of its head is definitely more allergy-friendly! Quieter dogs spread less saliva than dogs that bark a lot. Smaller dogs produce less urine, which can also trigger allergy symptoms. Female dogs are less likely to distribute that urine widely. Small dogs produce smaller quantities of allergens in general just because of their size. This post will consider terriers, a group that has produced several allergy-friendly breeds. Ranging from the diminutive Yorkshire terrier* to the large and imposing Airedale, terriers can have long, short, or wiry coats. Most wire-haired terriers are considered allergy-friendly dog breeds, while most smooth-coated terriers are not. * A true terrier at heart, the Yorkie was originally employed as a ratter in textile mills! It’s now classified as a Toy Breed by the AKC because of its tiny size and new job as a ‘purse pet’. The largest and grandest of all the terriers, the Airedale is also one of the calmest and least stubborn. Of course, he is still a terrier and will need the same things all terriers need. These include plenty of exercise, training, and consistency. These courageous terriers won’t back down from a perceived threat to those they love. That’s why they also need lots of socialization. The AKC has this to say about this highly intelligent breed: “…the breed’s versatility is legendary. Ratter, duck dog, big-game hunter, herder, guardian, warrior, actor, athlete, K-9 cop, and babysitter are jobs held at various times by the mighty King of Terriers.” He’s also been popular with Presidents – no fewer than three have owned this magnificent breed! This is the only native American hairless breed and comes in two varieties: hairless and coated. As the AKC puts it, “The hairless variety is as hypoallergenic as a dog can get.” Like other hairless breeds, the AHT requires special precautions while outside. His skin is prone to sunburn and he’ll need sunscreen for protection just like a human. In cold weather, your AHT will need you to provide a warm coat since he’s lost his own! He may even need a sweater inside if your home is on the cooler side. In all other respects, this is a terrier through and through. These inquisitive, spunky, playful dogs are active and will need regular exercise. Like other terriers, they love to dig and will appreciate a patch of dirt of their own! They are generally good with children and friendly with strangers, although (like all dogs) they should still receive proper training and socialization. Schnauzers come in three sizes: Miniature (maximum 14″ tall), Standard (18.5-19.5″ for males and 17.5-18.5″ for females), and Giant (minimum 25.5″ for males and 23.5″ for females). Other than size, all three breeds are similar. They’re smart, versatile, and very high-energy. They also detest boredom and will find an activity to fill the void. Make sure these dogs get lots of exercise, are properly trained, and given plenty of things to keep that busy brain occupied. They need firm, gentle, consistent training. Originally bred as all-around farm and stable dogs, Schnauzers earned their keep by ratting, hunting, herding, and protecting hearth and family. That protective nature means lots of socialization, starting early, is essential. By far the most popular, the Miniature Schnauzer is an active, sociable little dog who loves nothing better than charming people. Standard Schnauzers are the original German farm dog from which the other two Schnauzer breeds were developed. The German word ‘schnauzer’ means whiskered snout and ‘mittel’ means middle, so their German name ‘Mittelschnauzer’ means the ‘middle whiskered snout’. An apt name for these charmers! The Giant Schnauzer is the workhorse of this family. They’ve served as livestock herders, guard dogs, war dogs, police dogs, drug & explosive detectors, and in search & rescue. All of those different jobs just go to show how smart and trainable these dogs are. You’ll need to provide plenty of mental and physical stimulation to keep them happy and out of mischief. Described as having a ‘vivid personality’, the Scottie may be the most independent of this generally independent group. They’re confident, bold, self-assured, and almost comically dignified. They’re also aloof, territorial, and have a strong hunting instinct. Although they can be cantankerous around other dogs, they love their humans. Of course, that doesn’t necessarily translate into a desire to please! They’re very strong-willed and need gentle but firm training. As this site says: “Training is a challenge, for no breed has higher self-esteem or a stronger will — this is not a dog for permissive owners.” Early, thorough socialization is critical with this breed. The AKC describes these terriers as “merry extroverts”. Developed as a breed on Irish farms, Wheatens combine some of the best traits of both terriers and working dogs. Affectionate and fun-loving rather than feisty, these terriers are devoted to their families. If you are allergic to dog saliva, this might not be the breed for you due to their penchant for kisses. These bouncy dogs appear to have springs in their feet and can easily kiss you on the face! They can also bounce right over all but the tallest fences. These exuberant dogs require consistent training and plenty of socialization to help them become an enjoyable pet. This perennially popular little terrier looks almost like a plush toy. However, they are anything but plush! That coat is hard to the touch and it covers a game and courageous hunter. Westies were bred as ratters and they’re still always on the hunt. Typical terriers, they are stubborn and resistant to training. Patience and consistency are key with them. Because their adorable looks draw admirers wherever they go, it’s important that they’re properly socialized. Keeping them active and engaged will help prevent the mischief that results from boredom. Wire and Smooth Fox Terriers were reclassified by the AKC as two different breeds in 1985, but were originally considered two varieties of the same breed. The two breeds clearly show the allergy advantage of a wire-coated terrier over a smooth-coated one. The Smooth Fox Terrier sheds all year, especially in spring and fall, making it less of an allergy-friendly dog breed. If you’re looking for a delightful companion who is also a comedian, the Wire Fox Terrier may just fit the bill. They’re active, playful and loving. Typical terriers, they also have a strong hunting instinct and will need training and socialization. Their coats produce negligible shed hairs but will need regular brushing. Interestingly, they are mostly white with patches of color – as long as that color doesn’t resemble a fox. This was to keep them from being mistaken for the prey during a fox hunt! Whichever allergy-friendly dog breed you choose, it will need regular grooming to keep shedding (and dander) to a minimum. No pup comes with a lifetime non-shedding guarantee! It requires frequent brushing and occasional baths to keep your pet looking his best and your furniture and floors pet hair-free. Terriers don’t shed their coats naturally and need help to remove the dead hair. This means they’ll generally need regular attention from a professional groomer to keep their coats in tip-top shape. Contact us for help keeping your terrier in good shape inside and out. We can even help with training these delightfully stubborn dogs!